Data science is a combination of algorithm development, data inference, and technology. It is used to solve analytically complex problems. Businesses deal with data through customers’ mobile app usage, digital clicks, interactions on social media and more. They must take advantage of this to deliver the experiences customers are looking for. This is where data scientists come in the picture. They are deep thinkers with intense rational curiosity. According to the Harvard Business Review, it is the hottest job of the 21st century, and businesses are scrambling to fill these roles with the best and the brightest. If you want to get noticed by the companies, you need to enroll for a Data Science Training program right away. Ecommerce, Content, On-demand Services and Retail businesses are benefiting from data analysis by driving positive outcomes for the business and customers. Customers share their data with the companies to get a seamless experience across all touch points. And, businesses use this data to optimize the customer experience and develop longstanding relationships. Analyzing data effectively helps them in staying competitive when demand changes or new technology is developed. The prime focus of a business, large or small, is to know more about the processes in order to make better decisions. Therefore, data scientists who provide the deep, technical skills to convert modern mathematical models into useful business software are critical to any business. A real-world example of how brands use data science is Coca-Cola. In 2015, Coca-Cola was able to strengthen its data strategy by building a digital-led loyalty program. Big data analytics plays a crucial role behind customer retention at Coca-Cola. Another great example of a big brand that uses big data analytics for targeted advertising is Netflix. It has over 100 million subscribers, and the company uses this data to get the insights on what interests the subscriber most. It is rare to find someone who is not on the social networking site today. Social media is another vast source of data. Platforms like Facebook use this data for social media advertising. Apart from delivering smart customer experiences, data science uses security and fraud analytics to protect the physical, financial, and intellectual assets from misuse by internal and external threats. 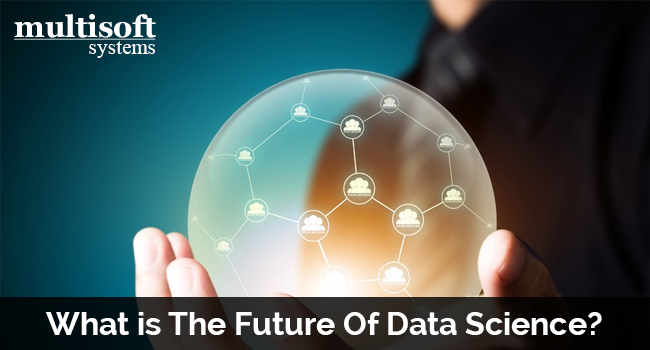 Companies are preparing for the future of data science by creating a culture for using machine learning models and their output, standardize and digitize processes, experimenting with a cloud infrastructure solution, and creating dedicated data science units. The exponential growth of data is not expected to slow down anytime soon. In fact, this is just the beginning. As expected, the coming years will bring an ever increasing data. Hence, the new data will create more data science models, giving rise to better models as well as new and innovative use cases. You need to venture outside of your comfort zone to take on the opportunities and challenges that this digital transformation brings. Multisoft Systems provides Data Science Trainings in Noida which cover all the core data science skills, like Hadoop, Pig, Python, Java, etc. Upon completion of the training, you will be specialized in a narrow niche of data science.